White Samsung Galaxy Y S5360 has just hit the UK that’s mean now you can get this wonderful handset for Christmas. This smartphone was already available in the Germany but just now it comes to UK. 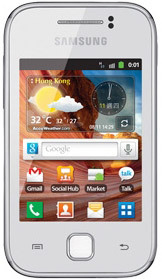 You can buy White version of Galaxy Y from Phones4U. This retailer is also offering black version of Galaxy Y with different offers. If you are a customer for Phone4U, then you get it on a Pay As You Go plan for £79.95 (approx. €95). However, those who are purchasing smartphones from O2, Orange, Vodafone and T-Mobile will be able to get it for free on different plans. So don’t wait anymore, just buy this handset for you since it will make your Christmas more enjoyable than before.